Instead of a one-to-one letter exchange like your newspaper cipher, computers use much more complex formula’s to encode your data. (If Grandpa Jo can sit down with a pencil and figure it out, a computer program would crack it in milliseconds). Instead, computers take blocks of data, pass it through a formula built on very large prime numbers, and spit out new blocks of “jumbled up” data. Only if you have the key, which is a long string of numbers, can you decode the data. Because factoring very large numbers into their very large prime factors is not an easy task for computers, modern encryption formulas such as AES are considered “unbreakable”. Theoretically, given enough processing power and time you could crack them. But even if you used every GPU in existence it would take you longer than the age of the universe. That’s pretty cool. 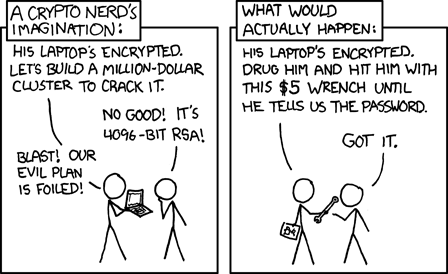 So, encryption keys are very important. Most encryption keys are linked to a password which is much easier to break, especially because most people don’t pick very good passwords. Check out our article on good passwords here. But what if you don’t want to share your encryption key even with the person to whom you are sending the message? There is a solution for that too! It is called public key encryption. The key that codes the message, is not the same on that de-codes the message. There is a public key and a private key. The public key encrypts the message, and the private key decrypts it. You keep your key private, but tell anyone who wants to send you a secret message to use a public key. That way, anyone can encrypt, but only you can decrypt. Of course, to go in the other direction, you would need a different pair of keys. You would need to use your friend’s public key to encrypt messages for her to decrypt with her private key. So are you protected? Talk to one of our security specialists today. Next Next post: What is a VPN?